The 2015 Château Martinon ($14.93) is a red wine produced in the region of Bordeaux Supérieur that contains grapes of 2015. It's a red with an opaque tone. In this Bodegas Anaxcrón 2000 predominate aromas of berries and red fruits . The flavour goes out right away. A really tasteful wine of red ruby colour . Aromas of coffee and wood. Fleshy. Chocolate coulant taste. The best pairing would have been fish. 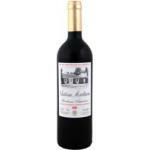 Buying wine online is easy at Uvinum, and I confirmed it when purchasing this red . Cherry red colour. Smell of gooseberries. A soft, fresh wine. It's a red I like to drink when I'm alone. A really tasteful wine of red ruby colour . Aromas of black currant. A Château Martinon is never a light experience. Aromas of oak. I don't know, it seemed a bit salty. Next time try it again. If you want to buy 2015 Château Martinon, at Uvinum you will find the best prices for Bordeaux Supérieur red wine. You can buy it at Uvinum, fast, easy and 100% safe. We have over 59.000 products for sale becoming this way the biggest online shop to sell wine, beer, and spirits in Europe with more than 38.000 clients who trust us.